Download the source and build the FacebookAPI project. 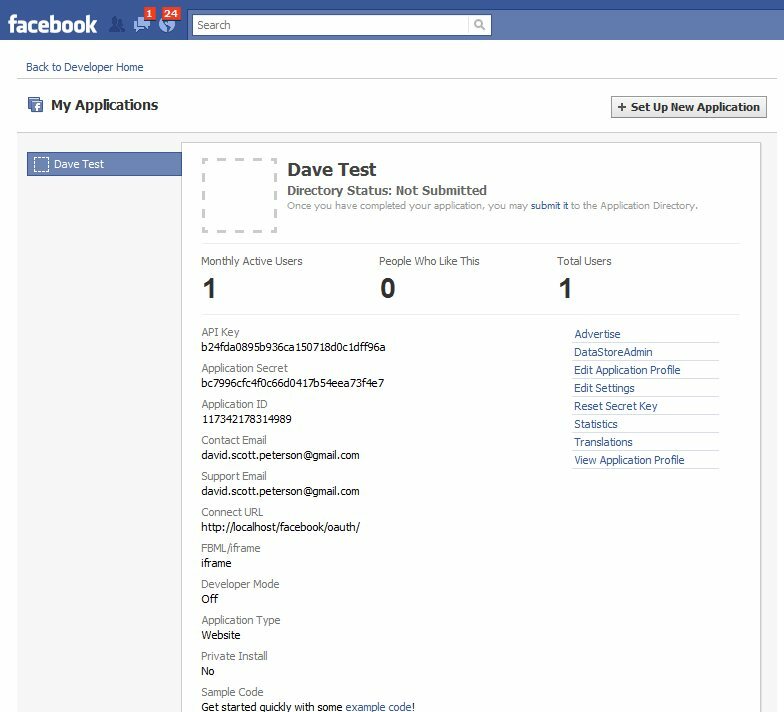 Create your Facebook application from the Developer Section of your Facebook profile’s Application Settings. 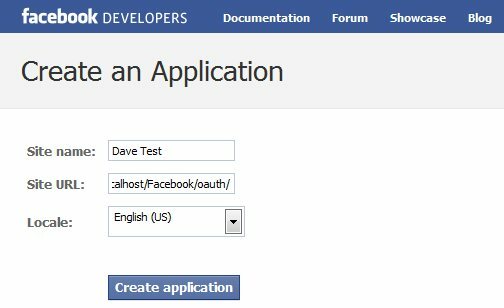 Coding your application to use the FacebookAPI. In this example, I’ll demonstrate the creation of a simple .NET application that communicates with Facebook to pull my profile and friends list. First, download the source of the Facebook API project. 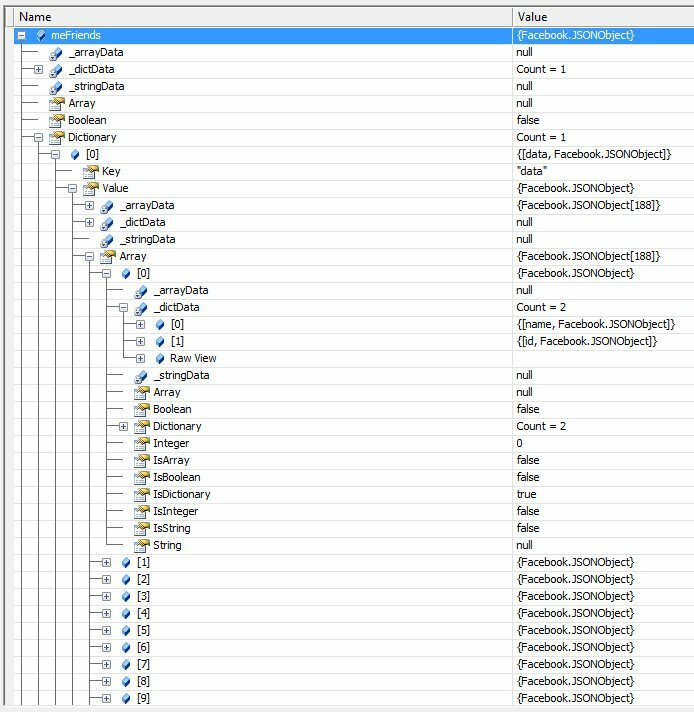 Open the solution FacebookAPI.sln in Visual Studio and build the project. You will later use Facebook API assembly to interact with Facebook via .NET. In order to successfully make calls to Facebook, you have to first register your application with Facebook and obtain authentication keys to be used with OAuth 2.0. 1. Go to http://developers.facebook.com/setup/ to begin registering your application. Make sure you use Internet Explorer. I ran into problems when attempting to register using Firefox (application would register, but a blank page was displayed). 2. Register the application using a site name and URL of the path relative to your authenticating logic. The redirect_url parameter you provide to the Facebook Graph API needs to match the path used to register the application. 3. Once registered, you can view your application’s configuration settings and authentication keys. These details will be referenced in the example code to make requests to Facebook. We need to send Facebook our application id and URL of the handler for Facebook’s redirect, containing our access token. Notice that the variable clientId matches the field Application Id in my Facebook Application configuration settings and the relative path in the variable redirectUrl matches the path defined in the field Connect URL. Notice the parameter code. This value will be used to request an access token from Facebook’s Graph API. In step 1, we’ve created the request to Facebook. In step 2, we need to build the handler to accept the access token provided by Facebook to successfully make API calls. Currently, there’s nothing built into the API that requests the access token, so I had to build one. The code below calls the Facebook Graph API, requesting an access token. 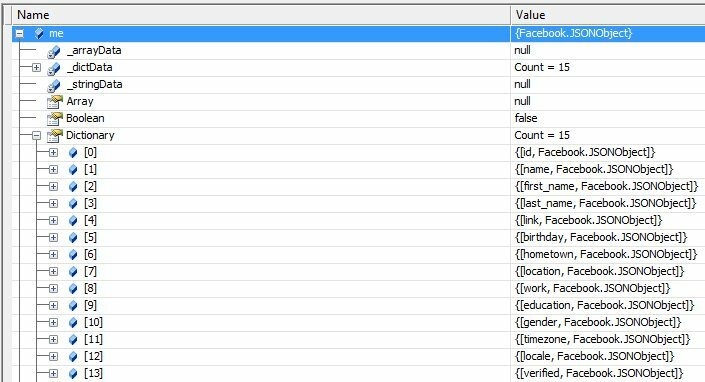 Variables clientId and clientSecret should match fields Application Id and Application Secret, respectively, in the Facebook Application Settings page. Scope defines the scope of the request. These values are considered Extended Permissions which means requesting access to data not marked as public to everyone in a user’s Facebook profile. The method GetOauthTokens accepts a parameter code. We’ll pass in the code value obtained in the query string param of the response in step 1 and cache the response for the time defined by the expiration value in Facebook’s Graph API response. making Get requests to Facebook via the API returns JSON containing profile information. The first requests my profile while the second obtains my friends list.